Anyway, one thing we all love when eating out are the delicious chips and salsa. 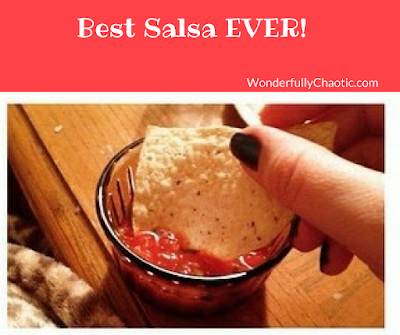 The store bought salsa just never tastes quite as good! They tend to taste too vinegary - is that even in a word?! - since many of them use it as a preservative. We've always felt like it really ends up coming through too much. A lot of them also seem to be missing some unique ingredients that the restaurant salsa has. (Hint: Cilantro & cumin!) Several years ago, we started googling "restaurant salsa" and found an AWESOME recipe from The Pioneer Woman that I've since tweaked to our family's personal preferences. Check it out and let me know what you think! Add all ingredients to blender or food processor and pulse to desired consistency - less for chunkier, more for smoother. (I personally like to have it smooth with just a bit of texture.) Put into large mixing bowl/container and refrigerate for 1-2 hours before serving with tortilla chips.